Retnowati, Lisa (2005) Persepsi remaja ketergantungan NAPZA mengenai dukungan keluarga selama masa rehabilitasi. Skripsi thesis, universitas Tarumanagara. NAPZA abused adolescent's should trough several stages of recovery process, such as rehabilitation period. During rehabilitation period adolescent's should spend much cost, much time, effort, discipline, strong will, and need support from their family as their close relative. Family support is able to help the effectivity of recovery process, especially in rehabilitation period. NAPZA abused adolescent's stay in rehabilitation center and are isolated from their family for a long time. This research used interview technique. 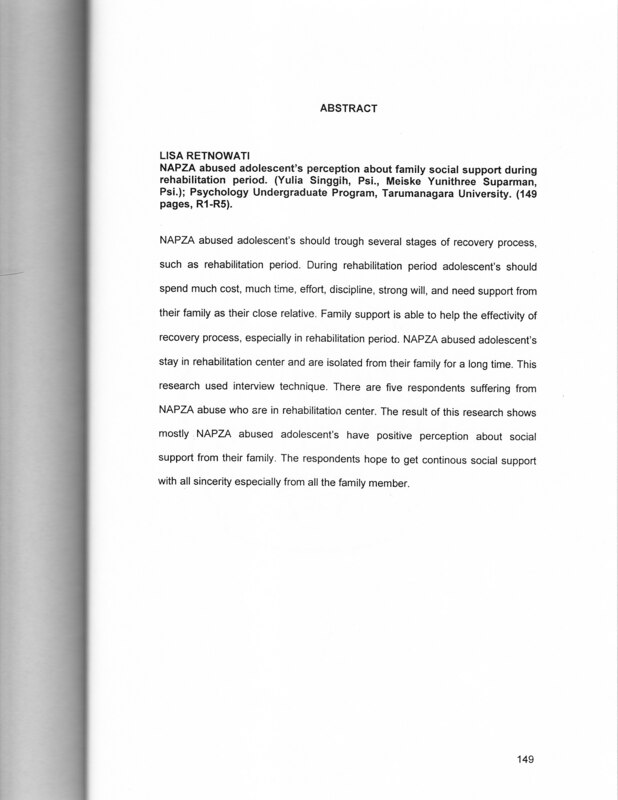 There are five respondents suffering from NAPZA abuse who are in rehabilitation center. The result of this research shows mostly .NAPZA abused adolescent's have positive perception about social support from their family. The respondents hope to get continous social support with all sincerity especially from all the family member.